This new series tracks the progress and priorities of our full-time PhD fellows. Some are new recruits living here in Maastricht, others are working abroad while waiting to defend. 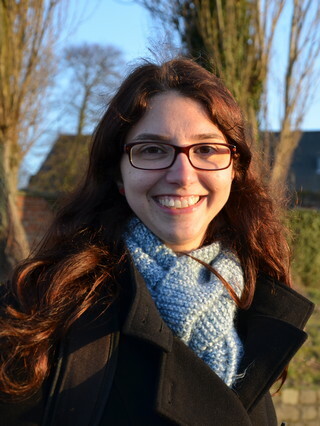 This time we caught up with Flavia Filippin, a PhD fellow who recently won a prize from the Brazilian Development Bank. NB: the next application deadline for our full-time PhD programme is 15 February 2019. Congratulations! You’ve won best Master’s thesis in Economics from the Brazilian Development Bank (BNDES). Can you summarise what you wrote about? How urgent or important was the topic, in terms of UN issues? My research was about a set of public policies to support the semiconductor industry in Brazil. These policies started to be designed in the early 2000s, when it was identified that developing a semiconductor industry in the country would foster innovation in the electronics industry. The latter was already present in the country, but it focused on assembling goods and relied on imported components to do so. Thus, several complementary policies were put in place over the years, including a state-owned company, a fiscal incentive and a training programme. My main goal was to discover where the initiative to design and implement these policies came from and how they were actually designed and implemented. What I found was that the idea came from civil servants who worked in organisations with close ties to the private sector. These civil servants not only had the idea and developed it, studying the semiconductor industry in great depth to do so, but also championed their idea, seeking the necessary support from the government to implement it. From that, I learned that both bottom-up and top-down approaches to designing public policies are important for their success and are in fact complementary. Civil servants know more about the reality of the problem and are better prepared to build sound policies. However, the support from senior government officials is crucial to see the policies executed. These policies to support the semiconductor industry in Brazil were an important part of a very broad development policy. As is widely known, Brazil has put in place several crucial policies to immediately alleviate conditions such as extreme poverty and hunger. However, the government also understood that policies that guarantee prosperity in the long run are also important, since they have the power to stop the reproduction of bad living conditions over time. The policies I studied fit in here, as well as several policies in the field of education. So, the immediate objective was to support one specific industry and to promote innovation across several downstream industries. The long-term objective behind these policies, however, was to promote economic growth and development in a way that would be sustainable over time and that would generate a significant number of well-paying jobs. What does the prize mean to you, both personally and professionally? I was, of course, very happy when I received the news that my thesis had been awarded Best Master Thesis. It’s great to get such acknowledgement for my work. However, this award was even more significant to me because of the crucial role historically played by BNDES in the implementation of development policies in Brazil and by the greater emphasis it gives today to the social aspects of development. Moreover, BNDES was one of the institutions involved in designing and implementing the policies I studied. I researched their successes and failures, the challenges they faced, the mistakes they made, and the results they achieved. 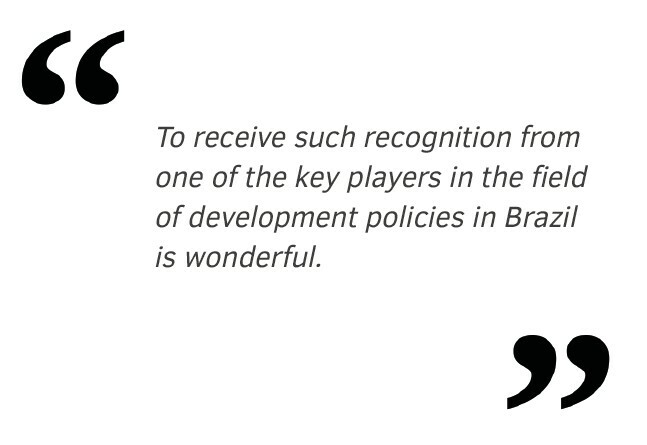 To receive such recognition from one of the key players in the field of development policies in Brazil is wonderful. You’ve been at our institute for a couple of years now. How does the work environment compare to Brazil? Both UNU-MERIT and the Institute of Economics at UNICAMP care deeply about the real world out there, about the real problems people face, especially those related to development, so I consider them very similar. What I miss most about Brazil is the warmth of the academic environment there, the permanent feeling of comradeship. So I must thank not only my supervisor, Prof. André Biancarelli, who supported me along the whole way, but also the whole academic community, all the professors, all the staff, and all the collegues and friends who made the time I spent there truly fantastic. 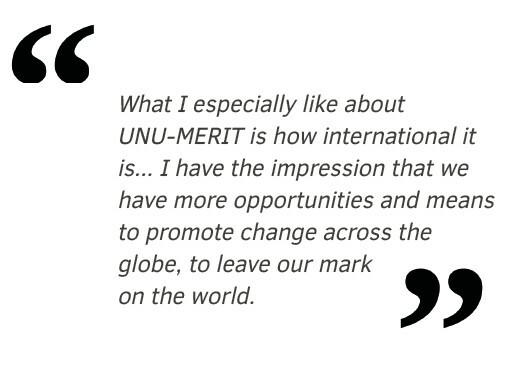 What I especially like about UNU-MERIT is how international it is. We have researchers, both students and staff, from all around the world. We regularly receive scholars from other countries who come to give us lectures. We send our on researchers to travel around and develop all kinds of partnerships and programmes abroad. So I have the impression that we have more opportunities and means to promote change across the globe, to leave our mark in the world. I see UNU-MERIT and the wider UN system as a platform for change. In this sense, I’m grateful to be working on the ‘DEIP’ innovation workshops for emerging economies – to be part of one of these initiatives. Moreover, DEIP, by training civil servants and policymakers to design effective innovation policies, is indeed not far from what I studied in my Master thesis, so it’s gratifying to be able to apply some of my past results to my current work. What comes next? What are your future plans? My main concern now is really to finish my PhD and hopefully deliver meaningful results! I will be very glad if, in the end, I’m able to bring insights that will contribute to better and sounder development policies.